This book consists of edited versions of the papers delivered at the Institute of International Shipping and Trade Law’s 11th International Colloquium, held at Swansea Law School in September 2015. Featuring a team of contributors at the top of their profession, both in practice and academia, these papers have been carefully co-ordinated so as to ensure to give the reader a first class insight into the issues surrounding international sale and carriage contracts. Part I offers a detailed and critical analysis on emerging issues and unresolved questions in international sales and the carriage contracts affected to facilitate such sales. Part II critically and thoroughly analyses the legal issues that often arise in the context of security over goods, letters of credit and similar documents. Part III is dedicated to a critical and up-to-date discussion on matters concerning cargo insurance in this context. 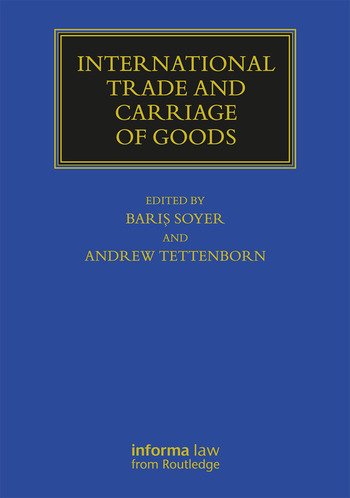 With its breadth of coverage and high-quality analysis, this book is vital reading for both professional and academic readers with an interest in international trade and carriage of goods. 2. Slow Steaming Clauses and International Sale Contracts: A Successful Marriage? 7. Discrepant Declarations about Containerised Goods "… in the middle of a chain reaction"
Baris Soyer is Professor of Commercial and Maritime Law, and Director of the Institute of International Shipping and Trade Law at Swansea University. Andrew Tettenborn is Professor of Commercial Law at the Institute of International Shipping and Trade Law at Swansea University. ...it would be difficult to find a clearer picture of a notoriously complex part of the Rotterdam Rules than the one painted by Professor Sturley.